July 27, 2003, L. & E. Crabo. Euxoa shasta is a large Euxoa (FW length 19–22 mm) with uniform dark red-brown forewings marked with pale-lined orbicular and reniform spots with smoky gray hindwings with pale at the base that flies along the east slope of the Cascades and in the Blue Mountains during late summer and fall. The forewing is nearly uniform red-brown, slightly darker and grayer in the terminal area and distal subterminal area. The veins are slightly darker on the distal half of the wing in many specimens. The basal, antemedial, and postmedial lines are usually faint or absent, evident as double gray spots on the costa and traces of the paler filling in most specimens. When evident the antemedial line is double, gray, filled with a slightly paler and gray-tinted shade of the ground color, weakly zigzagged on the veins and angled slightly toward the outer margin. The median line is absent below the costa. The postmedial line is weakly toothed on the veins, drawn toward the base on the costa, smoothly excurved around the reniform spot, and straight at an oblique angle toward the base below the cell. The subterminal line is thin pale gray or yellow, often partially absent, irregular. The terminal line is dark red-brown. The orbicular and reniform spots are weakly outlined in gray and peripherally lined with powdery pale yellow scales, filled with the ground color or a slightly darker and grayer shade thereof. The orbicular spot is small to moderate-sized, round or weakly oval. The reniform spot is kidney-shaped or boomerang-shaped, moderately large, often filled with yellow across its mid-portion and darker gray in the lower end. The claviform spot is absent or evident as a few pale scales. The hindwing is pale gray at the base, smoky gray along the veins and towards the margin, slightly darker in males than females. Dark gray veins, discal spot, and thin terminal line, and white fringe with a gray base are present in both sexes. The head and thorax match the wing color. The male antenna is weakly bipectinate with long fasciculations. Euxoa shasta is one of four species in the subgenus Palaeoeuxoa. 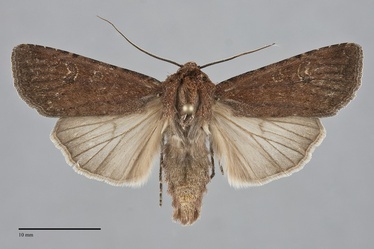 This subgenus is characterized by the combination of spoon-shaped tips of the saccular extensions and harpes of equal or greater length in males. This species can usually be identified by its large size for the genus, bright red-brown forewing color, pale-filled spots, and smoky gray hindwing. 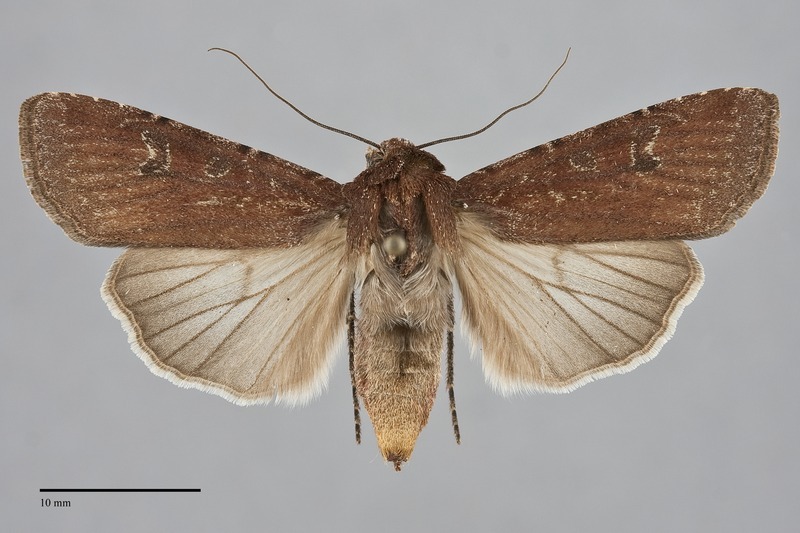 It is easily placed in the subgenus Palaeoeuxoa by the reddish forewing color and pale hindwing base. 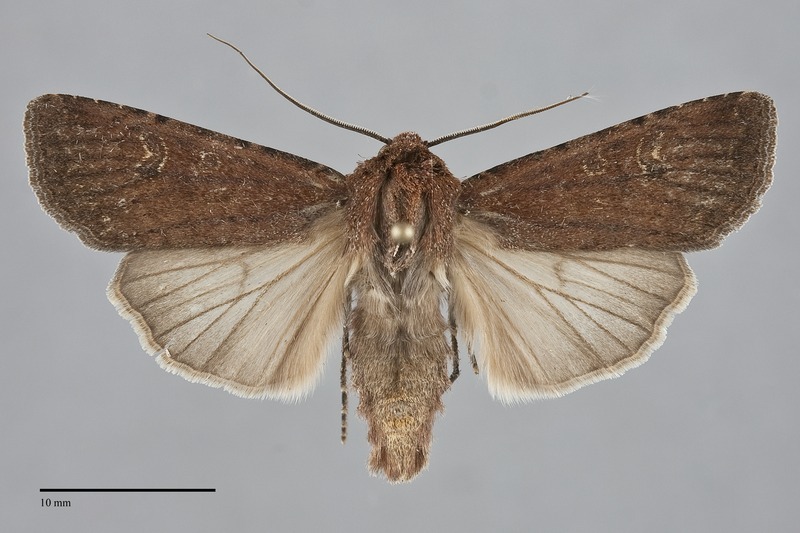 It is the largest species in the subgenus and also has the darkest hindwing. Its relationship to Euxoa biformata remains unclear in the Northwest and it is possible, even likely, that specimens identified as one of these species are misidentified or that there is only one variable species. Euxoa shasta is larger than E. biformata, has lighter and more powdery forewings, and darker gray hindwings. Lafontaine (1987) describes subtle differences in the shape of the distal harpes of the male genitalia between these species, but the females are indistinguishable by structure. Euxoa shasta is similar in size and color several unrelated species. 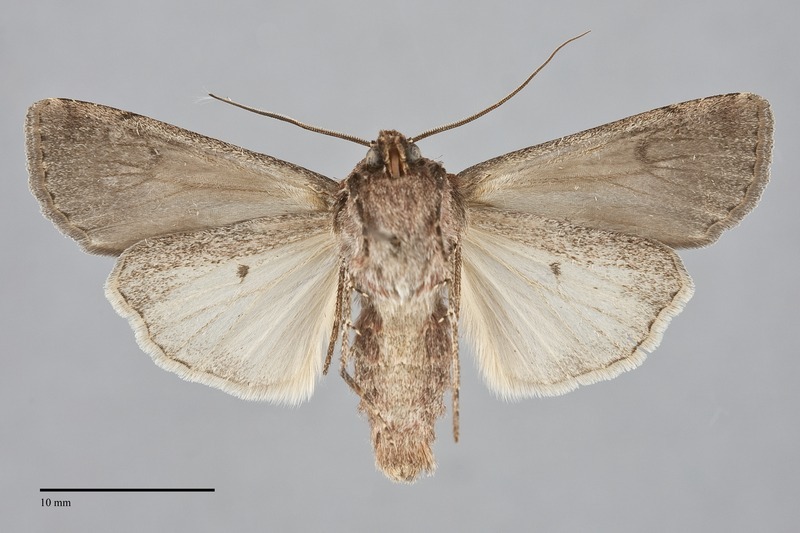 Apamea scoparia is similar in size and color and flies with E. shasta. The wings of E. shasta are narrower than those of A. scoparia and lack scalloping of the outer margin. The genitalia differ greatly and can be observed without dissection. Males of Apemea have a broad cucullus of the valve and lack saccular extensions, while females have flat horizontal ovipositor lobes unlike the conical ones of Euxoa. Euxoa is a very large genus with many similar species, many of which are also quite variable. The genus is defined by a saccular extension of the valves in males and sclerotized plates on the dorsal and ventral ductus bursae in females. 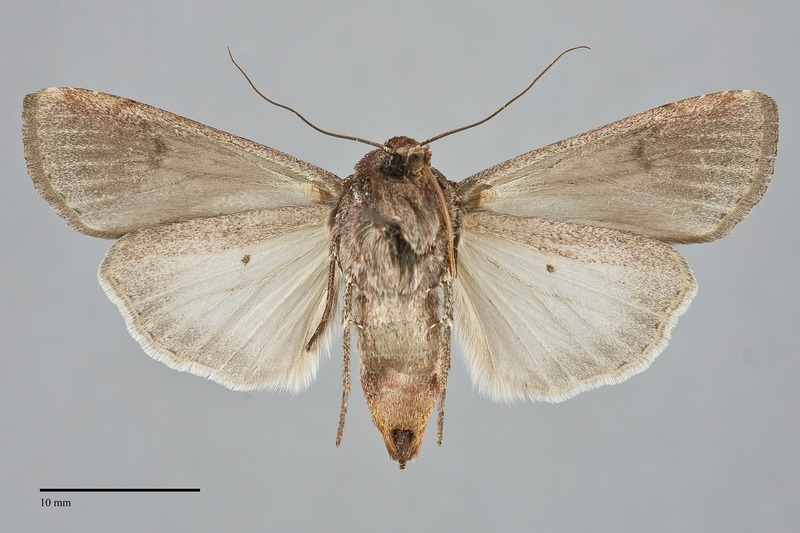 The genus was revised by Lafontaine (1987) in the Moths of North America series and is divided into eight subgenera based on structural characters. These moths are amongst the most difficult to identify. Even though the forewing color and strength of various markings can vary significantly in some of the species, the shape of the lines and spots and the color of the hindwings (often different in the sexes) are more constant. The habitat and flight period are also important in helping to narrow the possibilities. The larva of E. shasta is unknown. This species flies in mid-elevation coniferous forests in the Cascades and Blue Mountains. It is relatively rare and sporadic, and is most frequent in dry, open ponderosa pine forests on the east side of the Cascades. It also occurs in higher elevation spruce-fir forests. Euxoa shasta is found in the Cascade Range south of southwestern British Columbia. It also occurs in the Blue Mountains in northeastern Oregon. The range of E. shasta includes the Cascade Range of northern California and a highly disjunct population along the Gulf of St. Lawrence in eastern Quebec. No information is presently available regarding larval foodplants of this species, but it is probably a soil-surface feeding cutworm that feeds on herbaceous vegetation based on related species. Euxoa shasta has been collected from early July to mid-September in the Northwest. It is nocturnal and comes to lights.